Ernest Paul Komanapalli was born in a small village of India and has been raised up by God to be a blessing to the nation of India and to the world. International speaker, teacher, and leader, Founder-Chairman Emeritus of Manna Group of Ministries and its college of ministries (Manna Full Gospel Ministries, Miriam Children's Home, Rock Church Ministries, Rev. K.S.J. M. Hospitals, Arunodaya Ministries and Paramjyoti Educational Foundation). He is also the Presiding Bishop of Manna Full Gospel Churches and Rock Churches. Through a series of divinely ordained events subsequent to his graduation from Southern Asia Bible College ( India ), Ernest traveled to Jerusalem , Europe and then on to the United States of America . There he received both his bachelor's degree in Psychology from Barrington College (USA) and a master's degree in School administration and certification in special education from Rhode Island College (USA). He also received an honorary Doctorate from Christian International Seminary (USA). In 1963 he met and married his dear wife Rachel Jyothi who would not only share his life but also his ministry. Ernest and Rachel started Manna International in 1966 by supporting 2 pastors with their tithes. The Children's ministry started by giving one salary and living on the other. Ernest worked as a Special Education teacher and also as Director of a community school in the Providence , Rhode Island School system. Rachel first taught at the Early childhood center of Barrington College and then in Providence Public Schools. Upon receiving a vision from God, Ernest and Rachel moved to India from the USA . In the years to come God would bless their obedience and enlarge the boundaries of the ministry. 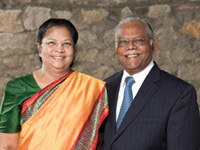 Ernest has served as Chairman of the Pentecostal fellowship of India at local, state and national levels. He presently serves as a member of the advisory committee of the Pentecostal World Fellowship. Rachel studied her Bachelor's degree in English Literature from AC College ( India ) and studied her Masters of Divinity degree at Andhra Christian Theological College and Serampore University. Drawing from her experience and credentials, Rachel serves as the Director of Rock Church Ministries, Rock Church Educational Foundation, Miriam Children's Home, Rev. K.S. J. M. Hospital and Paramjyoti Educational Foundation. This is in addition to her responsibilities as Principal of Manna Bible College and the Senior Pastor of Rock Church Hyderabad. Ernest and Rachel have 4 children and 7 grandchildren. Today Ernest and Rachel continue to be faithful to the vision God has given them. As they have been faithful to what God has given them He has raised them up as leaders not only in their own nation but also in the world. Bishop Spurgeon Raju Pachigalla is renowned preacher, teacher and leader throughout India and globally. He is the President of Manna Full Gospel Ministries and in that capacity oversees the churches related to Manna Ministries. He is Senior Pastor of Manna Church, Vijayawada. Bishop Spurgeon studied and received his Bachelor's degree from AC college ( India ) as well as Barrington College (USA). He distinguished himself in his field by receiving his Master of Divinity from Trinity Evangelical Seminary (USA) and an Honorary Doctorate from Christian International Seminary (USA). He is married to Rachel and they have 5 children. A gifted Administrator, Pastor and Leader, Carl David Komanapalli is the Residential Director and Secretary/Treasurer of Manna Full Gospel Ministries, Miriam Children's Home and Rev. K.S.J.M Hospitals. Under his able oversight, the vision of Ernest & Rachel Komanapalli is implemented through the children's work; educational institutions and medical outreach run smoothly and are a benefit to a multitude of people. He is the Senior Pastor of our "mother" church of the ministry situated at Amalapuram, which today brings glory to God with a membership numbering over 3,000. He received his Bachelor's Degree in Business Administration from American Christian College (USA). He is married to Sharon Rose and they have 3 children. An International Evangelist, Teacher and Speaker, Sudarshan Jyoti Komanapalli is the Chairman of the Manna Group of Ministries and the President of Manna International. He has been in the ministry since 1988. He received his education in Business Administration and Political Studies from Gordon College and studied Cross Cultural Studies at Fuller Seminary. He has also studied at the Kings University and the Jack W. Hayford School of Pastoral Nurture. Prior to his present positions in the Manna Group of Ministries, he worked as the Administrator for Manna/Rock Church Ministries in India. During this time he also pioneered and Pastored Manna Church in Hyderabad. Over the past 26 years he has had the privilege of speaking in various evangelistic gospel meetings, churches and conferences in India, Europe, Africa, South America, Australia, and USA. He also hosts and speaks on Manna TV programs which are seen around the world. Copyright � 2016 - 2017 Manna Group Of Ministries. All rights reserved.